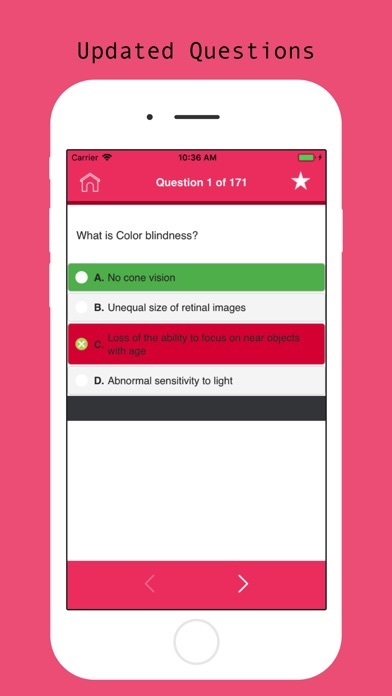 ABO Visual Prep American Board of Opticianry Test Prep Recently Updated ----- ABO Contents are recently updated based on official curriculums, Visual Prep Provides you three learning options. * Visual Mode * Training Mode * Student Mode Learn, Train and Pass your exam on the first attempt, Visual Prep Passing rate is more than 98% App Features: ---- *	Latest Update *	Three Learning Modes *	Verified Contents *	Save/Bookmark Unlimited Questions *	Lifetime Updates FREE *	Test Taking Strategy *	Testing Log *	Review Your Exam *	Friendly Interface *	Works without Internet Connection *	Dynamic and Static Content Updates FREE *	Trusted by Industry Professionals ---- WHAT IS ABO? Certification exams for opticians are offered by the American Board of Opticianry (ABO), while certification exams for ophthalmic dispensers are offered by the National Contact Lens Examiners (NCLE). Both organizations are non-profit certifying bodies whose programs are certified by the National Commission for Certifying Agencies. Each organization has developed a set of standards that opticians and ophthalmic dispensers must meet in order to earn initial certification. In addition, both organizations have requirements for continuing education as part of the recertification process. The ABO exam is called the National Opticianry Competency Exam (NOCE). The NCLE exam is called the Contact Lens Registry Examination (CLRE). LEGAL NOTICE: WE ARE NOT affiliated with any testing agency, certificate, test name or any trademark. All Trademarks are the property of respected trademark owners.